After spending two days living as cheaply as possible, my new accommodations felt like a palace! There was a real (hot water!) shower, the towels were arranged in the shape of flowers, and the resort had its own pool! The two could not have been more different. Sunda Resort is located in a sleepy little tourist town on the beach, and although it’s not directly on the water there was a little tuk-tuk shuttle to get to any of several beaches. Ari and I spent the next morning at the nearly empty beach, and got a Thai oil massage for about $10 (did I mention that Thailand is incredibly cheap?) then browsed the shops along the beach. We neglected to bring the phone number to call for the shuttle back, and were too cheap to pay for a taxi so we ended up walking about 40 minutes back to the resort. On the way we stopped for some street food which turned out to be the most amazing pad thai I have ever eaten. You find treasures in the most surprising places. My vacation ended at 5:30 the following morning when I awoke to catch my early flight back to Singapore. One more trip done and one more exam to go, but with memories of the best vacation I have ever had. The ferry ride improved my mood for several reasons: I met a couple from England and chatted with them for part of the trip, then sat up front dangling my feet over the edge and saw huge jellyfish in the water! A Thai family near by offered me some snacks – sugared dried fruit with chilis. Hot hot hot, but also very yummy. I arrived on Ko Phi Phi and found a warm and welcoming backpacker “family” at The Rock guesthouse; this sharply contrasted my bed which was nowhere close to “warm” or “welcoming”, and could probably be described using nearly any negative adective. Let’s just say there’s a reason it only cost about $5 per night. However, this didn’t put a damper on my mood and the night only got better – I was informed that the beach parties were not to be missed, and included free drinks just for showing up at a certain time! The twenty or so backpackers I was with dominated the otherwise quiet clubs which were just fenced areas on the beach with tables. A great way to relax after traveling for about six hours of traveling! …which more than made up for the rainy weather the previous day! I really didn’t do a whole lot that day – I’ve been getting tired of traveling to places, then rushing around trying to see everything important before I have to leave, which is hardly what I would call a vacation. 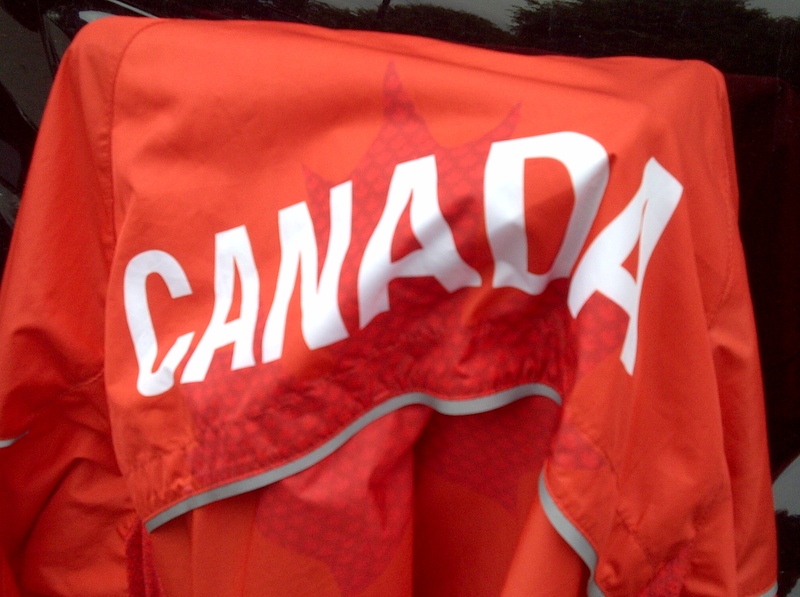 This was a vacation – and a half! My first two days were amazing, and reminded me again of why I want to go backpacking. I could have spent months in Thailand, and many of the backpackers on Ko Phi Phi obviously felt the same way since most were there for the maximum of 30 days allowed on their entry visa. 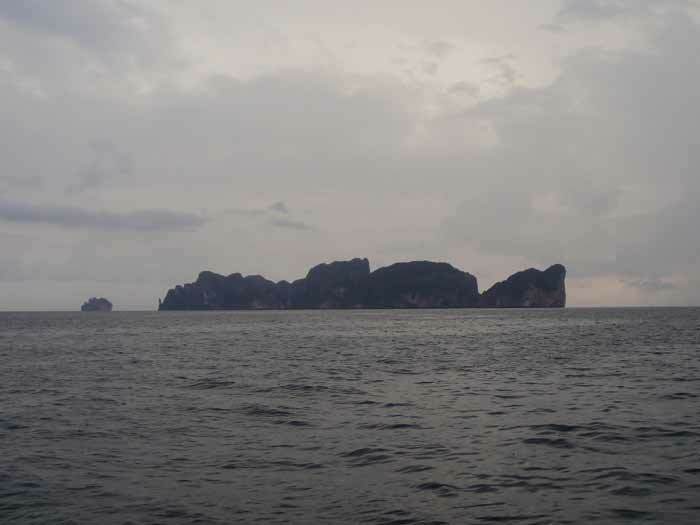 Time flew, and before I knew it I was headed back to the mainland to meet Ari at Ao Nang. Two of my favourite things in Singapore, and yesterday had the best of both. My day started early, and I got to experience the sun in my favourite way: sunrise on a run. It was dark at 6:30 when I woke up, but the day was brightening as I left the house and by the time I finished my short run the sun was shining and the day had started. The motivation for my early morning, a 9am exam, went very well despite starting around the time I’ve been waking up lately. I finished my essay question with two minutes to spare and had time to add a sentence or two to an earlier question before handing in my second exam of four. Two more to go! Unfortunately, after grabbing lunch with a friend I had to return to studying for my economics exam next week; I don’t think lying on a beach in Thailand will be very conducive to studying so I’m working extra hard before I go. Fortunately, I had the second great part of my day to look forward to: swimming! Every time I think it can’t possibly get any hotter it does, and I was dying by the time I got to the pool. Jumping into the refreshing water was even better than my run this morning, and if you know how much I like running then you’ll understand how good this was. I got into a rhythm quickly and it just clicked: I love that moment when it suddenly becomes easy. I enjoyed the quiet and solitude of my workout, a much needed break from everything else going on in my life. Before I knew it I’d reached 1000m…then 1200m…and when I finally reached 1600m I decided I was tired enough to finish! By this time there were threatening clouds moving in for their daily thunderstorm so I was happy enough to relinquish the pool. Swimming and sunshine: the recipe for a fantastic day. I’ve been here long enough to appreciate the differences between Singapore and Canada, and have noticed a few things Singapore does better. Canada, take note. Yes, it sounds stereotypical because there are two things everyone knows about Singapore: there are lots of laws and it’s very clean. Having said that, I wasn’t expecting the level of cleanliness I have become accustomed to; being clean is not limited to a noticeable lack of used chewing gum on sidewalks: it’s white shoes that stay white, sidewalks that are swept daily (sometimes more!) by an army of sweepers, and entire buildings that get washed. All of the vehicles look like they just drove off the dealer’s lot because they are so shiny, and I haven’t seen a vehicle which would even come close to inspiring a “wash me” or a “I wish my wife was this dirty” since I got here. That says something about a society that holds cleanliness sacred. For a country with a population of 5 million but encompassing only 710 square kilometers (only slightly larger than the City of Toronto), Singapore has some amazing green space with over 50 square kilometers of parks and nature reserves. One of the most notable nature reserves is MacRitchie Reservoir, one of my favourite weekend destinations for hiking, running or watching the monkeys; the Tree Top Walk is amazing, and the fitness parks are great for doing situps, pull-ups and any other kind of body-weight exercise. Another beautiful park is the Singapore Botanical Gardens, which has an outdoor amphitheatre with concerts on the weekend and stunning gardens and ponds. 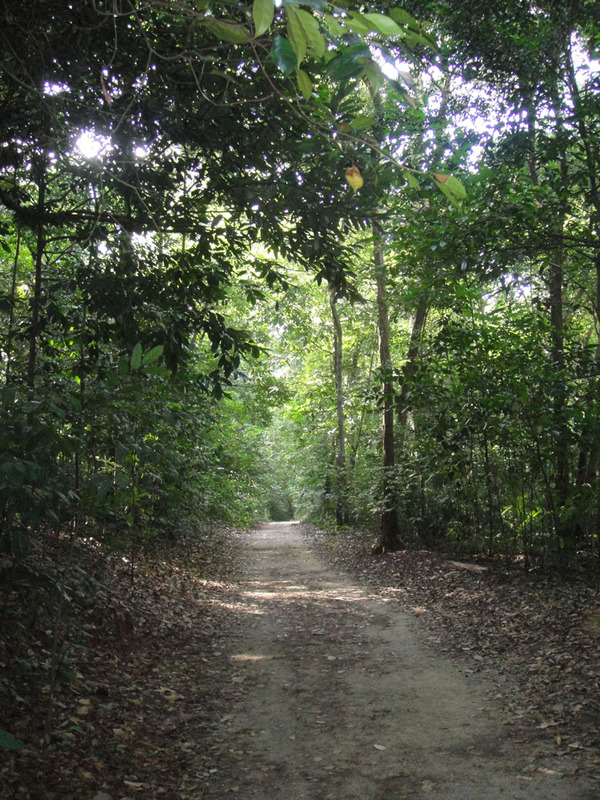 It’s a great place to go for a walk and relax and as with MacRitchie, there is no admission fee. Although I have to say I was biased when I first saw the National University of Singapore’s beautiful campus, the excellence of Singapore’s post-secondary education is not only skin deep. The government makes it much easier to attend post-secondary school by significantly subsidizing tuition fees for both Singaporeans and international students: a Singaporean engineering student at NUS pays only $6,890 SGD ($5,000 CAD) per year (8 months), compared to University of Waterloo tuition of $11,500 CAD for the same program. International students are not subsidized to the same extent as Singaporeans, but the portion of tuition paid by the student is only $11,030 SGD ($8,050 CAD) which is still significantly lower than the domestic tuition at University of Waterloo! These subsidies certainly make education more accessible and less stressful. The obvious question is, why would the Singapore Ministry of Education (MOE) subsidize international students? Each international student who takes advantage of government subsidized tuition is obligated to work in Singapore for three years after graduation in order to “discharge some of their obligations to the Singapore public”. 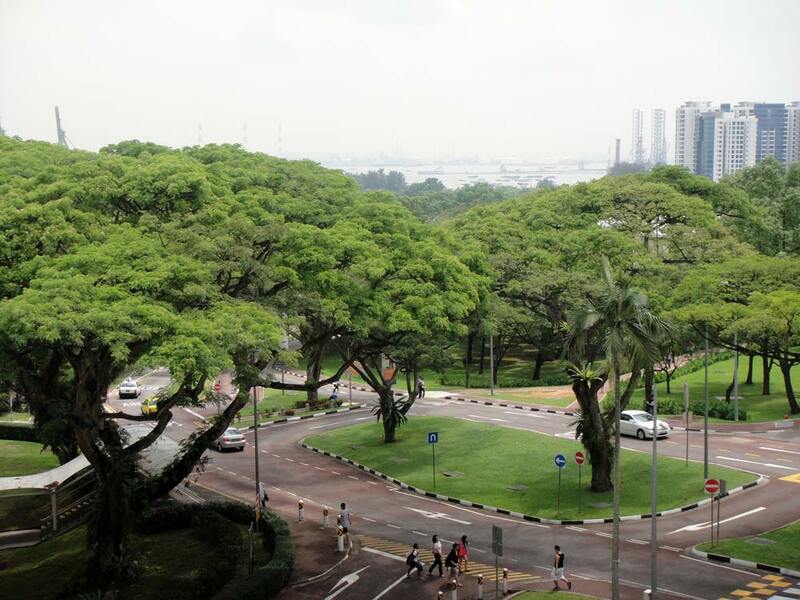 The road outside the Central Library at NUS with shipping yards in the background. Besides being known for its laws and cleanliness, Singapore is known as a beautiful city; this doesn’t happen by accident, and the city planning executed by the Urban Redevelopment Authority (URA) is spectacular. 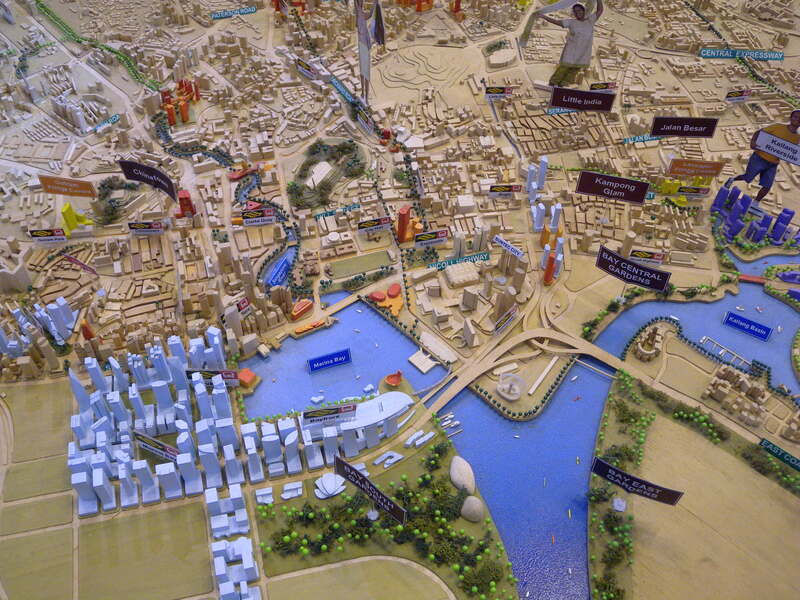 I had the chance to visit the gallery showcasing the present and future plans for Singapore, and I was amazed at the detail and intricacy of the displays – visiting the URA is like visiting an art gallery of the city. But urban planning isn’t just about making sure there are enough parks and roadways. The URA also dictates where and how many new apartment buildings are built, and commercial development in the business district. Even credit for the beautiful Singapore skyline goes to the URA. With large urban populations, traffic and pollution are two major problems often faced by cities; Singapore has addressed these issues by making private cars prohibitively expensive and by creating a very efficient public transportation system. Although making drivers pay close to $20,000 for a Certificate of Entitlement and increasing car prices by $50,000 is not a reasonable solution for Canada, the Toronto Transit Commission (TTC) has a lot to learn from Singapore’s transit system. One of the most important lessons in change management is this: if you want people to change you have to make it easy. Singapore makes it easy. First of all, the subway system covers all the important parts of Singapore and what isn’t covered by the subway is covered by efficient bus routes. Second, fares are paid based on distance and are typically much cheaper than the average ride on the TTC: I can get to school for about 90 cents, but TTC charges $3.00 per ride. Finally, the transit system is clean, well-lit and just looks nice; this may seem like no big deal, but it’s hard to make public transit attractive when taking the subway involves having a staring contest with someone’s abandoned candy bar wrapper (or worse!). Taking the MRT might mean I can’t drink my water on the train, but it’s a small price to pay. The Thai demonstrations which turned violent on the weekend have been one of the main topics in the news lately, even though they started over a month ago. Many of my friends in Singapore are concerned because of impending trips to Bangkok or Chiang Mai, and most people I’ve talked to at home are concerned primarily about my upcoming trip to Thailand. In the interest of not causing any heart attacks while I’m gone (or any grey hairs), I’ll go through some of the details affecting my trip. First of all, the details of my trip: I’m traveling to Krabi and the island of Ko Phi Phi on the Andaman coast in Southern Thailand; this is close to Phuket on the map above (you can click on it for a larger version). Both areas are based primarily around tourism and although they are not as resort-driven as Phuket, they are by no means back-country Thailand. 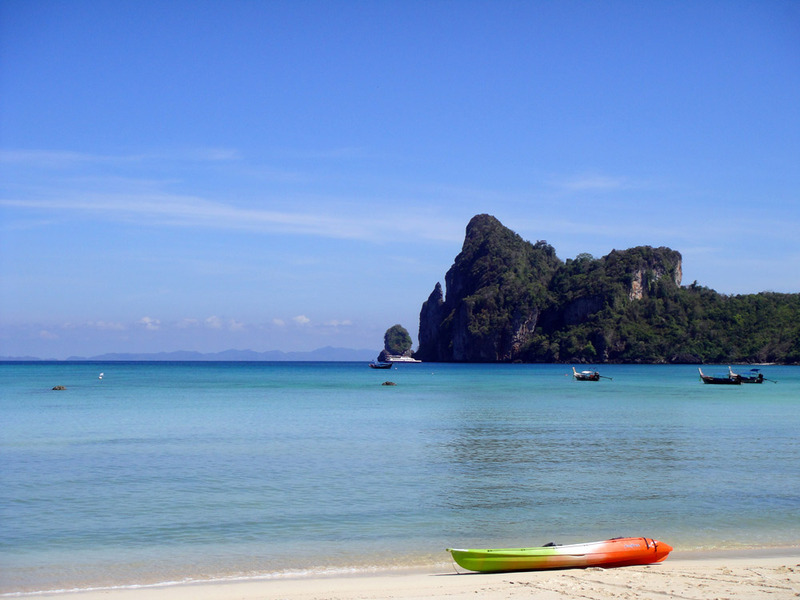 I arrive in Krabi on April 30 with Andrew, then take a ferry to Ko Phi Phi where I will spend two glorious days lying on the beach to my heart’s content. 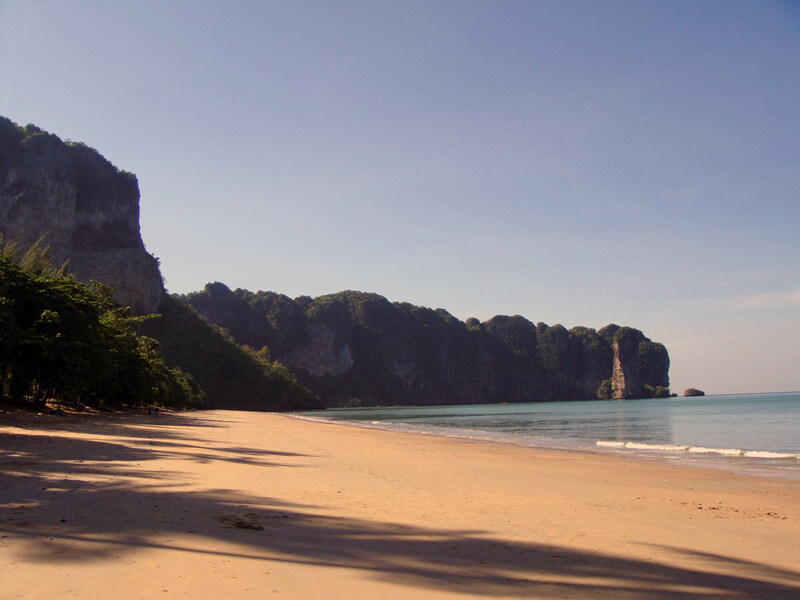 I return to Krabi on May 2, spend two nights there with Ari, then fly home early on May 4. Now to cover the travel concerns: so far the protests have been confined to Bangkok and the northern provinces, both of which are geographically distant from Krabi. The Thai government has declared a state of emergency in Bangkok and the Singapore government has advised against non-essential travel to the city; however, the Canadian government has yet to revise its travel advisory level for the region. 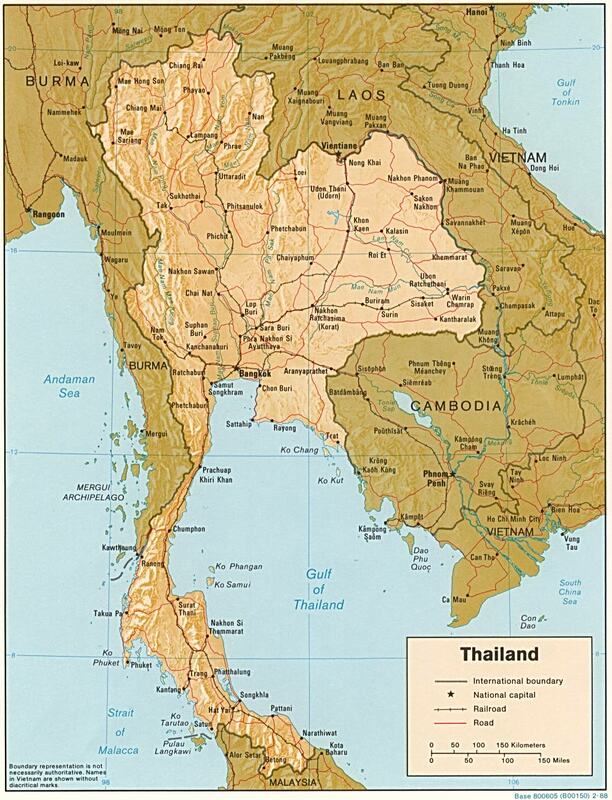 Other regions such as certain border provinces with Myanmar, Cambodia and Malaysia have experienced violence unrelated to the protests and the Canadian government advises against all travel to these provinces. The protests in Bangkok started on March 12, and were peaceful enough until the recent escalations. The Red Shirts are protesting the current government which they say took power without fair elections, and calling for Prime Minister Abhisit Vejjajiva to step down; government supporters (wearing yellow) have not had greatly publicized involvement with the protests. The Thai military has been trying to crack down on steadily escalating demonstrations and these clashes have recently become violent, but there have also been rumours that certain parts of the military are starting to become sympathetic to the Red Shirts’ cause and may call for the resignation of the Prime Minister. Traditionally the military has been very involved in Thai politics and has participated in coups where necessary; the Thai King may also call for the Prime Minister’s resignation, and it is hoped that this will happen soon as he has been hospitalized since September and his son is not as well loved by the Thai people. Barring these actions, there doesn’t seem to be any clear end in sight since Prime Minister Abhisit says he will not step down and the protesters show no signs of giving up. None of the demonstrations have targeted tourists, and the Red Shirts have not resorted to violent means in order to make their point known, so unless the situation becomes more widespread I am comfortable with the level of safety I can expect in Krabi and Ko Phi Phi. I will continue to stay up to date on the events that are unfolding in Thailand, and with the travel advisories issued by various governments, and I’ll post any revelations on here. The busiest week of the term is over, and I was ecstatic to hand in my last report on my way to the beach this morning! One more week (of lectures) to go! I spent a relaxing morning and afternoon lying on the beach, something I haven’t had the time to do since I got here. 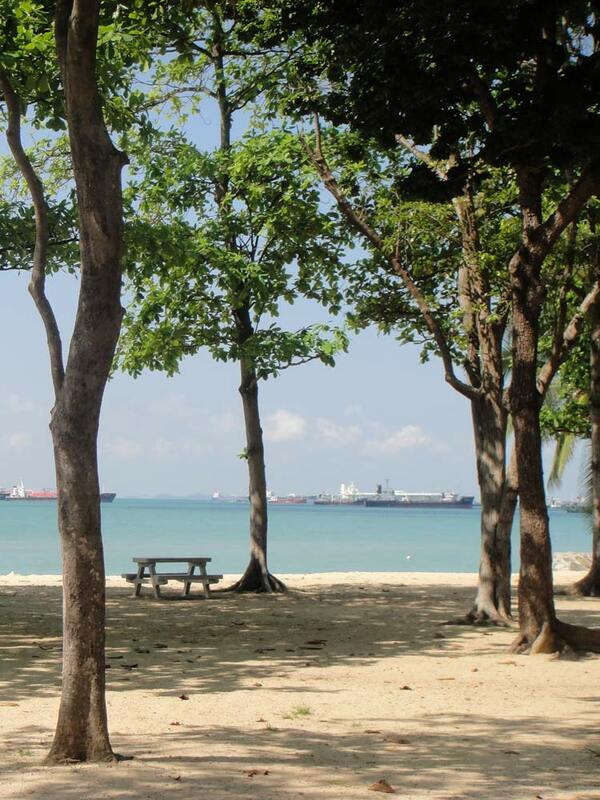 Singapore beaches are a little different from the typical beach however; as you’ll see in my photo, there are hundreds of ships anchored offshore. This is a bit of a unique experience, but in my opinion it doesn’t detract from the reasons for going in the first place – sand, sun and water. Of course the predicatable result was a bit of a burn, but I’ve been a little toasty since I got here and I do not intend to stop now! Did I mention Fridays off are awesome? I decided to get a little adventurous with my lunch today and tried laksa from a hawker center near my apartment complex. 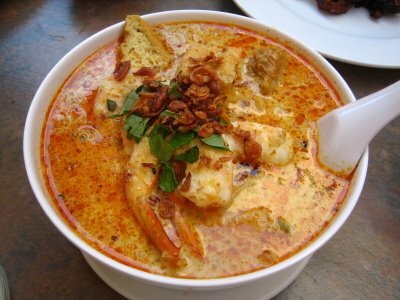 Laksa is a (slightly) spicy coconut-based soup with noodles and various meat and seafood, and is one of the main dishes in Singapore. I ordered prawns, cockles and fried tofu in mine and set out on a culinary exploration. The soup base is not too spicy, which is good because my spice tolerance is pretty – some would say very – low. What stood out most was the coconut taste, which gave it a bit of a creamy texture. I generally like coconut flavour, but I thought is was a little weird in soup; kind of like potato flavoured candy: potatoes and candy are both good on their own, but not quite right when put together. The prawns and tofu were tasty and very flavourful, but I discovered I do not like cockles. They’re just a little too fishy for me. While I enjoyed trying laksa, and I can see how many would find it delicious, I don’t think I would have it again; it’s just not quite my thing. There’s something about the name “Malaysia” that sounds so exotic to me – it’s one of those places that seems like it’s part fantasy and not completely in the real world. I think it’s because my only encounter with Malaysia has been at the Toronto Zoo, where the Malaysian pavilion was one we always visited; but I was only familiar with it in the sense I am familiar with the Aztecs: as an abstract concept. Notwithstanding, I have now traveled to Malaysia twice and as a result is has become a real place with real people and politics. As one of Singapore’s closest neighbours (both politically and spacially), it’s hard to go a day without hearing about some aspect of Malaysian society – in fact, for a brief period of time after independence, Singapore was part of Malaysia. Goodbye Peter Pan. My trip to Pulau Penang was very enjoyable, and a little less hectic than when I visited Kuala Lumpur. Penang is a reasonably sized island in northern peninsular Malaysia, and its capital is the very British-sounding Georgetown. The architecture matches the name and with the exception of the Buddhist temples and Muslim mosques scattered throughout the city, it is like visiting a little piece of Europe instead. Dad and I stayed at a very modern and friendly hostel named Hutton Lodge, and spent the first day walking all over Georgetown to see the various sights and attractions. On day two we had a relaxing breakfast (which lasted until lunch time) then hit the malls for some shopping before flying back to Singapore in the evening. The cost of these little trips continues to amaze me – we spent less than $100 each on the entire two day trip, including all transportation, flights, lodging, shopping and food. Nowhere else can you experience so much for so little. Although St. Patrick’s Day is not really celebrated by Singaporeans, a bunch of us managed to find an Irish pub to celebrate in. O’Bama’s Irish Pub is most certainly named after President Obama, and the crowd was mainly ex-pats and tourists – the most white people I have seen in once place since I got here! It was a very enjoyable evening sitting on a patio and drinking Irish beer.